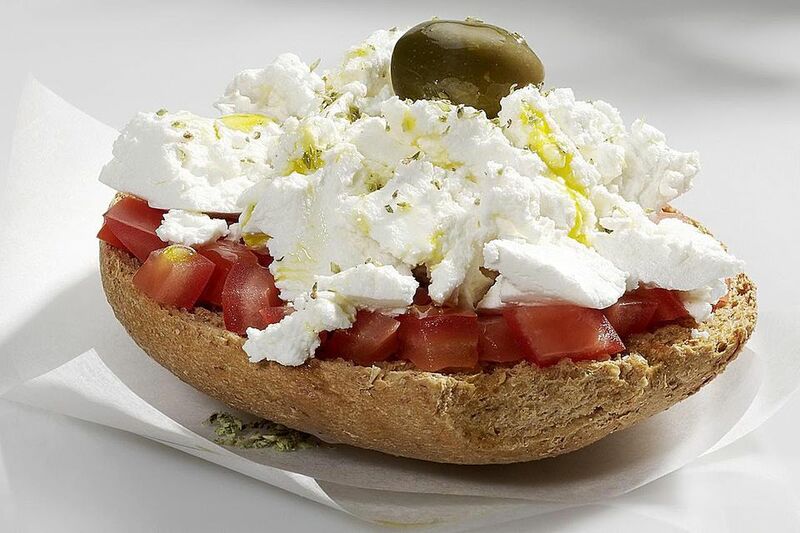 A traditional meze or light meal on the island of Crete, dakos (also called "koukouvayia") is often called "Greek bruschetta," and is easy to make with few ingredients and no cooking. You can find rusks at online Greek food shops, make your own, or use a thick slice of grilled or toasted crusty country bread (without the water). Run the rusk under a spray of water (about 4-6 tablespoons) to moisten. Grate the tomato with a vegetable grater (or the large grate on a multi-grater) into a strainer over a bowl so most of the liquid drains off. Spread the grated tomato on the rusk and top with cheese. Sprinkle with pepper and a good amount of oregano, and drizzle with olive oil. Aged myzithra cheese is the traditional cheese for this dish on Crete. Some like to add a couple of thin slices of bell pepper and/or onion. They aren't part of the original recipe, but can be used if desired.